The 2018 Varshik Rashifal has a good prediction for Meena Rashi individuals in 2018. Understanding what the future holds for you is worth consideration. This is for the reason that it gives one a sign of good hope. Well, at times you might be sure of the future but it still makes sense if you double checked on what the Rashifal 2018 predicts for you. Unlike the previous years, 2018 is a year worth anticipating for the Meen Rashi natives. During this season, there is no doubt that your career goals would come to fore. This is something that you have been yearning for all this time and perhaps the patience was worth it. You will have time to celebrate your achievements this year. To ensure that the same routine goes on all year long, you will need to find a way of communicating with your work mates. Ensure that you appreciate their help in getting you to the top. Meena Rashi individuals would go through several ups and down in terms of their finances in 2018. There are months where you would be happy financially whereas in some months you would be struggling. This year you would also have to be careful on how you spend your money with friends and family. Meen people tend to be philanthropic at times and this could hurt you in the end. It is advisable that you try and save for the future as this would keep you financially stable all year long. The position of Saturn and Jupiter speaks volume about the Meen Rashi love life in 2018. There is a high probability that you would find peace in the love relationships that you would be involved in. Those that are dear to you would find a reason to commit and enjoy the love that you offer to them. Expect the same in return. Planning for a pregnancy is a good idea. Nevertheless, there are some that might face hurdles in their love lives due to the effect of Rahu in the 5th house. This implies that you would have to find a way of getting past this without getting too emotional. 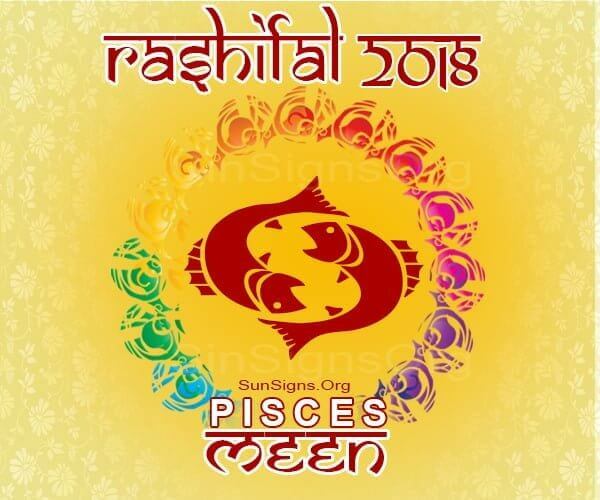 The Meen 2018 Rasiphal says that the predictions are not that good for Meena Rashi with regards to their health. There are instances where they would go through a series of health problems including food poisoning and stomach upsets. To be on the safe side, you would have to rely more on homely cooked meals as opposed to fast foods. Vegetables and fruits should also be part of your regular diet to keep you healthy and fit. Above all, a regular routine workout plan is highly recommended. For Meena Rashi people, Bhavishya Jyotish predictions are that in 2018, you would be moving a lot to different places. This could be change of business or change of your residential place. There are few months where you would also feel like taking personal trips to go and have fun. Well, certainly, you should not hesitate the urge as you definitely deserve it. While doing this, you need to ensure that you have a well planned budget to stick to. The last thing you need is heading back home with financial dilemmas to sort out. Meena Rashi people have a lot to expect come 2018. The best part is that everything seems fine considering the predictions made. A few adjustments here and there would have to be made to ensure that you remain happy. Emotionally, you are ready to take a leap and fall in love again. The Meen 2018 Rashifal foretells that this is the best year to take advantage of. Commitment is something that would fulfill your love desires in all angles.